Do you want to get behind the wheel of a pre-owned Toyota Corolla that’s as affordable as it is reliable? Check out Beaver Toyota’s inventory of used Toyota Corollas! We have a variety of used and certified pre-owned Toyota Corollas from recent model years, with low mileage, and in several trim levels from which you can choose. Take your pick, and then get in touch to jump start the financing process. CARFAX One-Owner. PRISTINE CONDITION, SUNROOF / MOONROOF / ROOF, Leather, Bluetooth Handsfree, NO ACCIDENTS ON CARFAX REPORT, Rear View Camera, NONSmoker, Local Trade, MUST SEE!, Fresh Oil Change, Passed Dealership Inspection, Freshly Detailed, MINT CONDITION, EXCELLENT CONDITION. 29/37 City/Highway MPG Priced below KBB Fair Purchase Price! Slate Metallic 2016 Toyota Corolla S FWD 1.8L I4 DOHC Dual VVT-i Awards: * 2016 KBB.com Best Buy Awards Finalist * 2016 KBB.com 5-Year Cost to Own Awards Slate Metallic 2016 Beaver Toyota Corolla S is a 4D Sedan FWD . This Florida Sedan has a 1.8L I4 DOHC Dual VVT-i engine. Call right now and schedule a test drive. Ask for stock number 531729, the Florida 2016 Beaver Toyota Corolla . Shop Us Online at www.beavertoyotastaugustine.com. Serving Jacksonville, Palm Coast, Daytona, Gainesville and St Augustine. Beaver Toyota St Augustine on 2995 US Hwy 1 South in St Augustine. CARFAX One-Owner. Certified. PRISTINE CONDITION, Bluetooth Handsfree, Rear View Camera, One Owner, NONSmoker, Local Trade, MUST SEE!, Fresh Oil Change, Passed 160 Point Toyota Certified Inspection, Passed Dealership Inspection, Freshly Detailed, EXCELLENT CONDITION, ITS CERTIFIED ,AND WE ARE ON OF THE TOP TEN CERTIFIED DEALERSHIPS IN THE COUNTRY,WE HAVE THE BEST WE PROVIDE YOU AND YOUR FAMILY WITH THE BEST USED CARS IN THE MARKET! !, ABS brakes, Electronic Stability Control, Illuminated entry, LE Plus Package, Low tire pressure warning, Traction control. 27/36 City/Highway MPG Priced below KBB Fair Purchase Price! Red 2016 Toyota Corolla LE Plus FWD 1.8L I4 DOHC Dual VVT-i Toyota Certified Used Vehicles Details: * Limited Comprehensive Warranty: 12 Month/12,000 Mile (whichever comes first) from certified purchase date. Roadside Assistance for 1 Year * Roadside Assistance * Powertrain Limited Warranty: 84 Month/100,000 Mile (whichever comes first) from original in-service date * 160 Point Inspection * Vehicle History * Warranty Deductible: $50 * Transferable Warranty Awards: * 2016 KBB.com 5-Year Cost to Own Awards * 2016 KBB.com Best Buy Awards Finalist Red 2016 Beaver Toyota Corolla LE Plus is a 4D Sedan FWD . This Florida Sedan has a 1.8L I4 DOHC Dual VVT-i engine. Call right now and schedule a test drive. 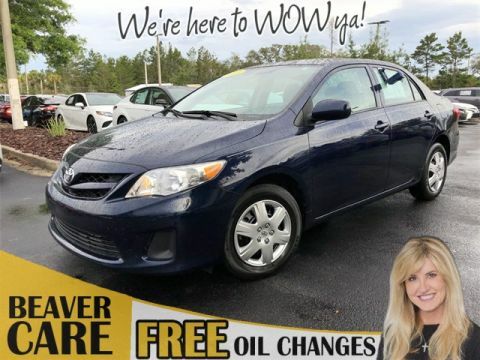 Ask for stock number P948392A, the Florida 2016 Beaver Toyota Corolla . Shop Us Online at www.beavertoyotastaugustine.com. Serving Jacksonville, Palm Coast, Daytona, Gainesville and St Augustine. Beaver Toyota St Augustine on 2995 US Hwy 1 South in St Augustine. CARFAX One-Owner. Clean CARFAX. Certified. PRISTINE CONDITION, NO ACCIDENTS ON CARFAX REPORT, TOYOTA CERTIFIED*7 YEAR/100K MILE WARRANTY*$0 DEDUCTIBLE*BUY WITH PEACE OF MIND, One Owner, NONSmoker, Fresh Oil Change, Passed Dealership Inspection, Freshly Detailed, EXCELLENT CONDITION, another certifed used car from the top certified used car dealership in the country ,we care ,and we want every customer to trust us for life!!. Priced below KBB Fair Purchase Price! White 2016 Toyota Corolla L FWD 1.8L 4-Cylinder SMPI DOHC Toyota Certified Used Vehicles Details: * Transferable Warranty * 160 Point Inspection * Roadside Assistance * Vehicle History * Warranty Deductible: $50 * Limited Comprehensive Warranty: 12 Month/12,000 Mile (whichever comes first) from certified purchase date. Roadside Assistance for 1 Year * Powertrain Limited Warranty: 84 Month/100,000 Mile (whichever comes first) from original in-service date Awards: * 2016 KBB.com 5-Year Cost to Own Awards * 2016 KBB.com Best Buy Awards Finalist White 2016 Beaver Toyota Corolla L is a 4D Sedan FWD . This Florida Sedan has a 1.8L 4-Cylinder SMPI DOHC engine. Call right now and schedule a test drive. Ask for stock number P900690A, the Florida 2016 Beaver Toyota Corolla . Shop Us Online at www.beavertoyotastaugustine.com. Serving Jacksonville, Palm Coast, Daytona, Gainesville and St Augustine. Beaver Toyota St Augustine on 2995 US Hwy 1 South in St Augustine. CARFAX One-Owner. Clean CARFAX. Certified. ABS brakes, Active Cruise Control, Electronic Stability Control, Heated door mirrors, Illuminated entry, Low tire pressure warning, Remote keyless entry, Traction control. 28/36 City/Highway MPG Silver 2017 Toyota Corolla LE FWD 1.8L I4 DOHC Dual VVT-i Toyota Certified Used Vehicles Details: * Roadside Assistance * Limited Comprehensive Warranty: 12 Month/12,000 Mile (whichever comes first) from certified purchase date. Roadside Assistance for 1 Year * Powertrain Limited Warranty: 84 Month/100,000 Mile (whichever comes first) from original in-service date * Transferable Warranty * Vehicle History * Warranty Deductible: $50 * 160 Point Inspection Awards: * 2017 KBB.com 5-Year Cost to Own Awards * 2017 KBB.com 10 Best Sedans Under $25,000 * 2017 KBB.com Best Resale Value Awards * 2017 KBB.com 10 Most Awarded Brands Silver 2017 Beaver Toyota Corolla LE is a 4D Sedan FWD . This Florida Sedan has a 1.8L I4 DOHC Dual VVT-i engine. Call right now and schedule a test drive. Ask for stock number Y520462A, the Florida 2017 Beaver Toyota Corolla . Shop Us Online at www.beavertoyotastaugustine.com. Serving Jacksonville, Palm Coast, Daytona, Gainesville and St Augustine. Beaver Toyota St Augustine on 2995 US Hwy 1 South in St Augustine. CARFAX One-Owner. Certified. PRISTINE CONDITION, Bluetooth Handsfree, NO ACCIDENTS ON CARFAX REPORT, TOYOTA CERTIFIED*7 YEAR/100K MILE WARRANTY*$0 DEDUCTIBLE*BUY WITH PEACE OF MIND, Rear View Camera, One Owner, NONSmoker, Local Trade, MUST SEE!, Fresh Oil Change, Passed Dealership Inspection, Freshly Detailed, MINT CONDITION, EXCELLENT CONDITION. 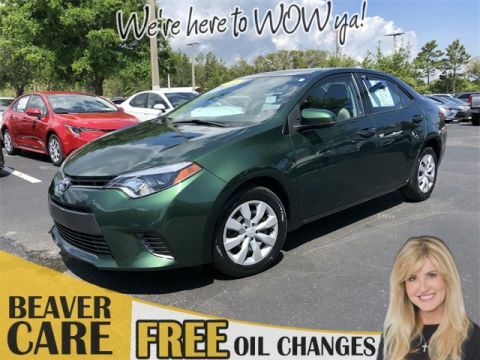 29/38 City/Highway MPG 4Evergreen Metallic 2016 Toyota Corolla LE FWD 1.8L I4 DOHC Dual VVT-i Toyota Certified Used Vehicles Details: * Warranty Deductible: $50 * Transferable Warranty * Limited Comprehensive Warranty: 12 Month/12,000 Mile (whichever comes first) from certified purchase date. Roadside Assistance for 1 Year * 160 Point Inspection * Powertrain Limited Warranty: 84 Month/100,000 Mile (whichever comes first) from original in-service date * Roadside Assistance * Vehicle History Awards: * 2016 KBB.com Best Buy Awards Finalist * 2016 KBB.com 5-Year Cost to Own Awards 4Evergreen Metallic 2016 Beaver Toyota Corolla LE is a 4D Sedan FWD . This Florida Sedan has a 1.8L I4 DOHC Dual VVT-i engine. Call right now and schedule a test drive. Ask for stock number 701124, the Florida 2016 Beaver Toyota Corolla . Shop Us Online at www.beavertoyotastaugustine.com. Serving Jacksonville, Palm Coast, Daytona, Gainesville and St Augustine. Beaver Toyota St Augustine on 2995 US Hwy 1 South in St Augustine. CARFAX One-Owner. Certified. PRISTINE CONDITION, Bluetooth Handsfree, NO ACCIDENTS ON CARFAX REPORT, One Owner, NONSmoker, Local Trade, MUST SEE!, Fresh Oil Change, Passed 160 Point Toyota Certified Inspection, Passed Dealership Inspection, Freshly Detailed, MINT CONDITION, EXCELLENT CONDITION. 28/36 City/Highway MPG Priced below KBB Fair Purchase Price! 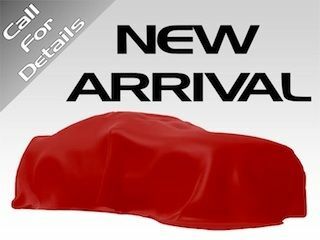 Barcelona Red Metallic 2018 Toyota Corolla LE FWD 1.8L I4 DOHC Dual VVT-i Toyota Certified Used Vehicles Details: * Roadside Assistance * Powertrain Limited Warranty: 84 Month/100,000 Mile (whichever comes first) from original in-service date * Warranty Deductible: $50 * Limited Comprehensive Warranty: 12 Month/12,000 Mile (whichever comes first) from certified purchase date. 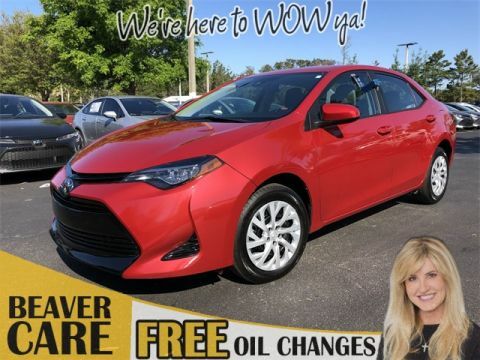 Roadside Assistance for 1 Year * 160 Point Inspection * Vehicle History * Transferable Warranty Barcelona Red Metallic 2018 Beaver Toyota Corolla LE is a 4D Sedan FWD . This Florida Sedan has a 1.8L I4 DOHC Dual VVT-i engine. Call right now and schedule a test drive. Ask for stock number 846498, the Florida 2018 Beaver Toyota Corolla . Shop Us Online at www.beavertoyotastaugustine.com. Serving Jacksonville, Palm Coast, Daytona, Gainesville and St Augustine. Beaver Toyota St Augustine on 2995 US Hwy 1 South in St Augustine. CARFAX One-Owner. Clean CARFAX. Certified. PRISTINE CONDITION, Bluetooth Handsfree, NO ACCIDENTS ON CARFAX REPORT, TOYOTA CERTIFIED*7 YEAR/100K MILE WARRANTY*$0 DEDUCTIBLE*BUY WITH PEACE OF MIND, Rear View Camera, One Owner, NONSmoker, Local Trade, MUST SEE!, Fresh Oil Change, Passed Dealership Inspection, Freshly Detailed, MINT CONDITION, EXCELLENT CONDITION, ANOTHER HANDPICKED USED CAR FROM BEAVER TOYOTA ,WE HAVE THE BEST USED CERTIFIED CARS IN THE MARKET ,WE HAVE THE BEST AND WE SELL THE SAFEST USED CARS ON THE ROAD FO R YOU AND YOUR FAMILY!!. 28/36 City/Highway MPG Priced below KBB Fair Purchase Price! 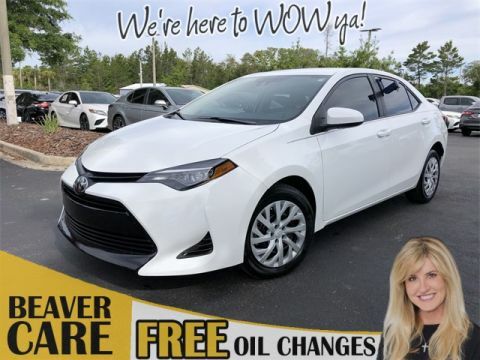 White 2019 Toyota Corolla LE FWD 1.8L I4 DOHC Dual VVT-i Toyota Certified Used Vehicles Details: * Roadside Assistance * 160 Point Inspection * Transferable Warranty * Vehicle History * Limited Comprehensive Warranty: 12 Month/12,000 Mile (whichever comes first) from certified purchase date. 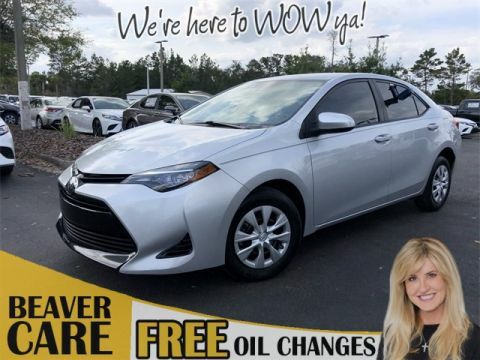 Roadside Assistance for 1 Year * Warranty Deductible: $50 * Powertrain Limited Warranty: 84 Month/100,000 Mile (whichever comes first) from original in-service date White 2019 Beaver Toyota Corolla LE is a 4D Sedan FWD . This Florida Sedan has a 1.8L I4 DOHC Dual VVT-i engine. Call right now and schedule a test drive. 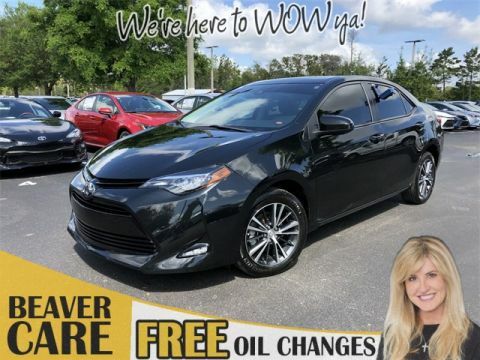 Ask for stock number X140109A, the Florida 2019 Beaver Toyota Corolla . Shop Us Online at www.beavertoyotastaugustine.com. Serving Jacksonville, Palm Coast, Daytona, Gainesville and St Augustine. Beaver Toyota St Augustine on 2995 US Hwy 1 South in St Augustine. CARFAX One-Owner. Clean CARFAX. Certified. PRISTINE CONDITION, SUNROOF / MOONROOF / ROOF, Bluetooth Handsfree, NO ACCIDENTS ON CARFAX REPORT, TOYOTA CERTIFIED*7 YEAR/100K MILE WARRANTY*$0 DEDUCTIBLE*BUY WITH PEACE OF MIND, Rear View Camera, One Owner, NONSmoker, Local Trade, Bought here NEW!, MUST SEE!, Fresh Oil Change, Passed 160 Point Toyota Certified Inspection, Passed Dealership Inspection, Freshly Detailed, MINT CONDITION, EXCELLENT CONDITION, LE PREMIUM PACKAGE ,SPECIAL ORDER CAR ,HANDPICKED AT BEAVER TOYOTA ,AGAIN,ANOTHER SPECIALTY CERTIFIED USED CAR FROM THE TOP CERTIFIED TOYOTA DEALERSHIP IN THE COUNTRY ,YES WE ARE NUMBER ONE ,YES WE HAVE THE BEST SERVICED USED CARS IN THE MARKET ,YES WE CARE ABOUT OUR CUSTOMERS ,YES WE MAKE SURE YOU AND YOUR FAMILY BECOME PART OF OUR ROYAL SERVICE EXPERIENCE AND JOIN THE BEAVER FAMILY FOR LIFE!! !, 16" x 6.5" Alloy Wheels, LE Premium Package w/Moonroof, LED Daytime Running Lights (DRL), Radio: Entune Audio Plus w/Connected Navigation, Tilt & Slide Moonroof. 28/36 City/Highway MPG Black 2018 Toyota Corolla LE FWD 1.8L I4 DOHC Dual VVT-i Toyota Certified Used Vehicles Details: * 160 Point Inspection * Vehicle History * Warranty Deductible: $50 * Limited Comprehensive Warranty: 12 Month/12,000 Mile (whichever comes first) from certified purchase date. 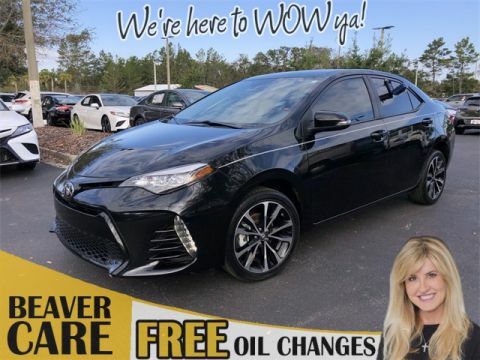 Roadside Assistance for 1 Year * Roadside Assistance * Powertrain Limited Warranty: 84 Month/100,000 Mile (whichever comes first) from original in-service date * Transferable Warranty Black 2018 Beaver Toyota Corolla LE is a 4D Sedan FWD . This Florida Sedan has a 1.8L I4 DOHC Dual VVT-i engine. Call right now and schedule a test drive. 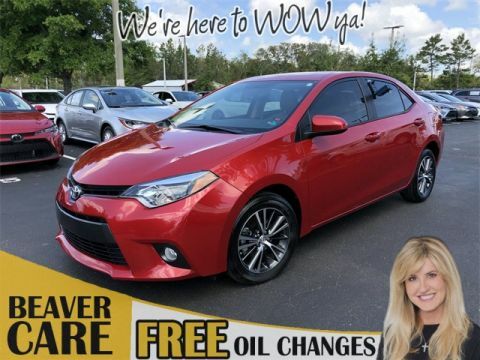 Ask for stock number W003217A, the Florida 2018 Beaver Toyota Corolla . Shop Us Online at www.beavertoyotastaugustine.com. Serving Jacksonville, Palm Coast, Daytona, Gainesville and St Augustine. Beaver Toyota St Augustine on 2995 US Hwy 1 South in St Augustine. CARFAX One-Owner. Clean CARFAX. Certified. ABS brakes, Alloy wheels, Electronic Stability Control, Heated door mirrors, Illuminated entry, Low tire pressure warning, Remote keyless entry, Traction control. 29/37 City/Highway MPG 2016 Toyota Corolla S Plus FWD 1.8L I4 DOHC Dual VVT-i Toyota Certified Used Vehicles Details: * Warranty Deductible: $50 * Roadside Assistance * Powertrain Limited Warranty: 84 Month/100,000 Mile (whichever comes first) from original in-service date * Limited Comprehensive Warranty: 12 Month/12,000 Mile (whichever comes first) from certified purchase date. Roadside Assistance for 1 Year * Transferable Warranty * Vehicle History * 160 Point Inspection Awards: * 2016 KBB.com Best Buy Awards Finalist * 2016 KBB.com 5-Year Cost to Own Awards 2016 Beaver Toyota Corolla S Plus is a 4D Sedan FWD . This Florida Sedan has a 1.8L I4 DOHC Dual VVT-i engine. Call right now and schedule a test drive. Ask for stock number 617526, the Florida 2016 Beaver Toyota Corolla . Shop Us Online at www.beavertoyotastaugustine.com. Serving Jacksonville, Palm Coast, Daytona, Gainesville and St Augustine. Beaver Toyota St Augustine on 2995 US Hwy 1 South in St Augustine. CARFAX One-Owner. Clean CARFAX. Certified. ABS brakes, Active Cruise Control, Alloy wheels, Electronic Stability Control, Heated door mirrors, Illuminated entry, Low tire pressure warning, Remote keyless entry, Traction control. 28/36 City/Highway MPG Black Cherry Pearl 2017 Toyota Corolla 50th Anniversary Special Edition FWD 1.8L I4 DOHC Dual VVT-i Toyota Certified Used Vehicles Details: * Powertrain Limited Warranty: 84 Month/100,000 Mile (whichever comes first) from original in-service date * Transferable Warranty * Warranty Deductible: $50 * 160 Point Inspection * Vehicle History * Limited Comprehensive Warranty: 12 Month/12,000 Mile (whichever comes first) from certified purchase date. Roadside Assistance for 1 Year * Roadside Assistance Awards: * 2017 KBB.com 5-Year Cost to Own Awards * 2017 KBB.com 10 Best Sedans Under $25,000 * 2017 KBB.com Best Resale Value Awards * 2017 KBB.com 10 Most Awarded Brands Black Cherry Pearl 2017 Beaver Toyota Corolla 50th Anniversary Special Edition is a 4D Sedan FWD . This Florida Sedan has a 1.8L I4 DOHC Dual VVT-i engine. Call right now and schedule a test drive. Ask for stock number U226515A, the Florida 2017 Beaver Toyota Corolla . Shop Us Online at www.beavertoyotastaugustine.com. Serving Jacksonville, Palm Coast, Daytona, Gainesville and St Augustine. Beaver Toyota St Augustine on 2995 US Hwy 1 South in St Augustine. CARFAX One-Owner. Clean CARFAX. Certified. ABS brakes, Active Cruise Control, Alloy wheels, Electronic Stability Control, Heated door mirrors, Illuminated entry, Low tire pressure warning, Remote keyless entry, Traction control. 28/35 City/Highway MPG Black Sand Pearl 2018 Toyota Corolla SE FWD 1.8L I4 DOHC Dual VVT-i Toyota Certified Used Vehicles Details: * Powertrain Limited Warranty: 84 Month/100,000 Mile (whichever comes first) from original in-service date * 160 Point Inspection * Transferable Warranty * Warranty Deductible: $50 * Limited Comprehensive Warranty: 12 Month/12,000 Mile (whichever comes first) from certified purchase date. Roadside Assistance for 1 Year * Roadside Assistance * Vehicle History Black Sand Pearl 2018 Beaver Toyota Corolla SE is a 4D Sedan FWD . This Florida Sedan has a 1.8L I4 DOHC Dual VVT-i engine. Call right now and schedule a test drive. 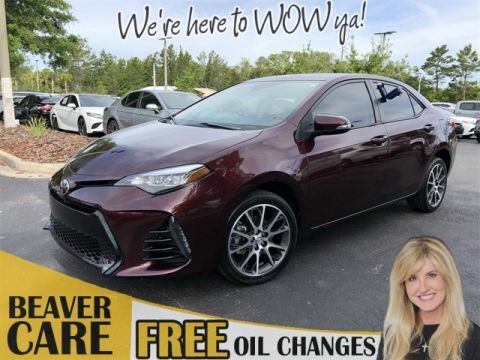 Ask for stock number 807614, the Florida 2018 Beaver Toyota Corolla . Shop Us Online at www.beavertoyotastaugustine.com. Serving Jacksonville, Palm Coast, Daytona, Gainesville and St Augustine. Beaver Toyota St Augustine on 2995 US Hwy 1 South in St Augustine. CARFAX One-Owner. Clean CARFAX. Certified. PRISTINE CONDITION, Leather, Bluetooth Handsfree, NO ACCIDENTS ON CARFAX REPORT, TOYOTA CERTIFIED*7 YEAR/100K MILE WARRANTY*$0 DEDUCTIBLE*BUY WITH PEACE OF MIND, Rear View Camera, LEATHER, One Owner, NONSmoker, Local Trade, Bought here NEW!, MUST SEE!, Fresh Oil Change, Passed 160 Point Toyota Certified Inspection, Passed Dealership Inspection, Freshly Detailed, MINT CONDITION, EXCELLENT CONDITION, WORLD CLASS CERTIFIED USED CARS FROM THE WORLD CLASS BEAVER TOYOTA ,THE NUMBER ONE CERTIFIED TOYOTA DEALERSHIP IN THE COUNTRY, WE PROVIDE THE BEST USED CARS IN THE MARKET! !, WE WANT TO MAKE SURE THAT EVERY USED CAR IS TOTALLY READY TO BE THE BEST CERTIFIED USED CARIN THE MARKET! !WE MAKE SURE THAT YOU AND YOUR FAMILY BUY THE BEST AND SAFEST USED CAR IN THE MARKET!!. 28/35 City/Highway MPG White 2018 Toyota Corolla SE FWD 1.8L I4 DOHC Dual VVT-i Toyota Certified Used Vehicles Details: * Powertrain Limited Warranty: 84 Month/100,000 Mile (whichever comes first) from original in-service date * Warranty Deductible: $50 * Transferable Warranty * 160 Point Inspection * Roadside Assistance * Limited Comprehensive Warranty: 12 Month/12,000 Mile (whichever comes first) from certified purchase date. Roadside Assistance for 1 Year * Vehicle History White 2018 Beaver Toyota Corolla SE is a 4D Sedan FWD . This Florida Sedan has a 1.8L I4 DOHC Dual VVT-i engine. Call right now and schedule a test drive. 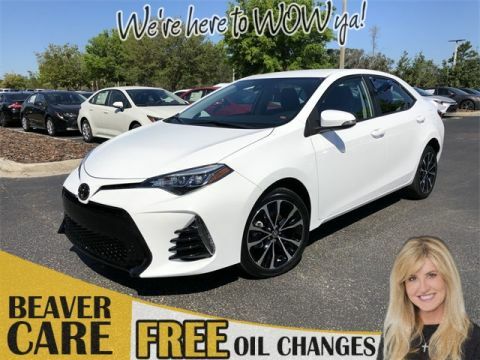 Ask for stock number 1035935A, the Florida 2018 Beaver Toyota Corolla . Shop Us Online at www.beavertoyotastaugustine.com. Serving Jacksonville, Palm Coast, Daytona, Gainesville and St Augustine. Beaver Toyota St Augustine on 2995 US Hwy 1 South in St Augustine. Clean CARFAX. White 2018 Toyota Corolla FWD 1.8L I4 DOHC White 2018 Beaver Toyota Corolla is a 4D Sedan FWD . This Florida Sedan has a 1.8L I4 DOHC engine. Call right now and schedule a test drive. Ask for stock number 775484, the Florida 2018 Beaver Toyota Corolla . Shop Us Online at www.beavertoyotastaugustine.com. Serving Jacksonville, Palm Coast, Daytona, Gainesville and St Augustine. Beaver Toyota St Augustine on 2995 US Hwy 1 South in St Augustine. The history of the Toyota Corolla is proud and stable. Toyota Corolla models regularly get 30+ miles per gallon, and the 2014 redesign really boosted efficiency for this great model. With more recent models, the Toyota Corolla will come with Toyota Safety Sense™ features and packages all at a price that is right for you! 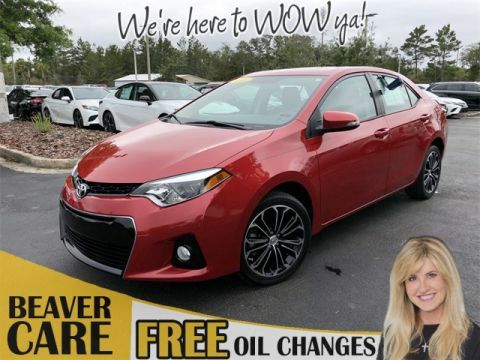 Stop by Beaver Toyota in St. Augustine to learn more about our used Toyota Corolla inventory!